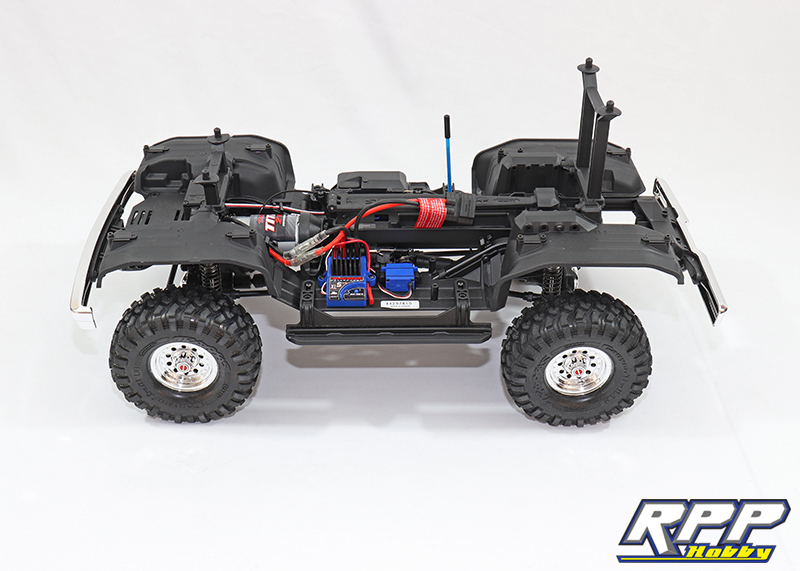 As most of you probably know Traxxas has been a leader in the R/C industry for years with their monster trucks and ballistically fast brushless truggies. 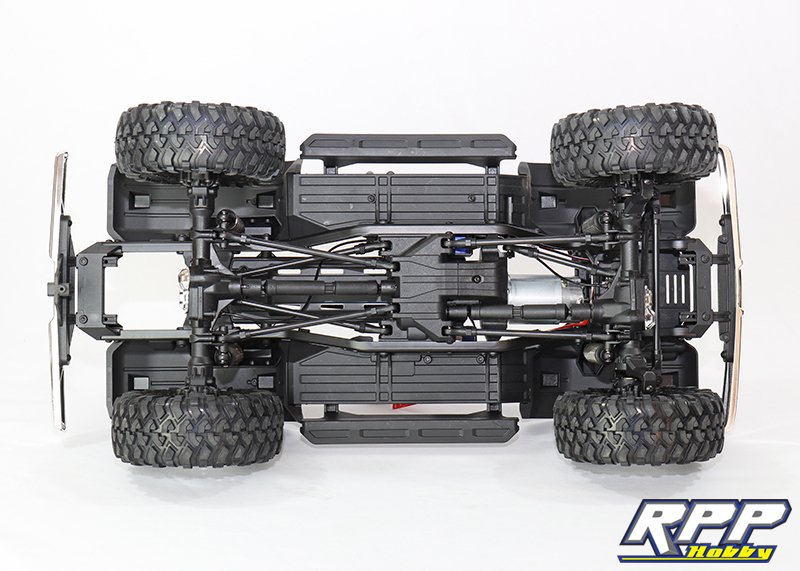 And we are also guessing most of you know Traxxas stepped away from their speedy ways when they recently released the TRX-4 RTR R/C Rock Crawler. 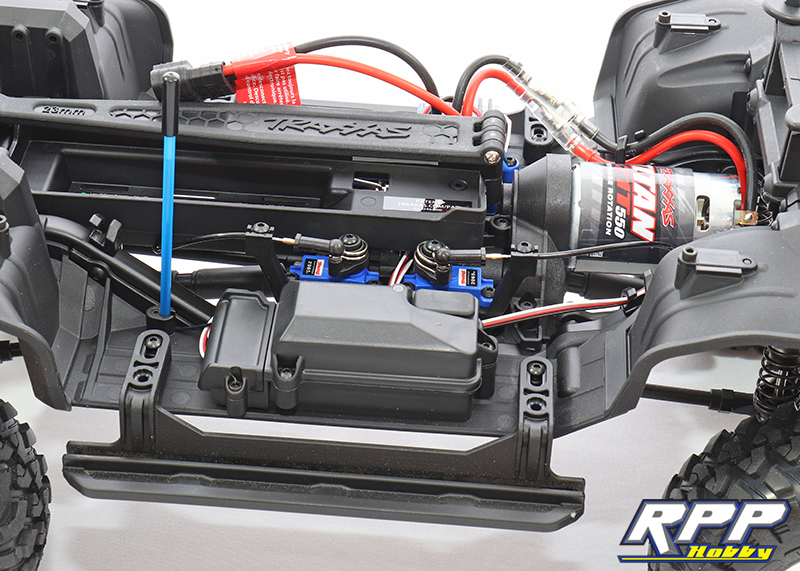 In true Traxxas style they hit it out of the park with numerous features included in the RTR version, like cable actuated locking differentials, portal axles, high and low speed transmission, scale chassis, inner fender wells, and much more. 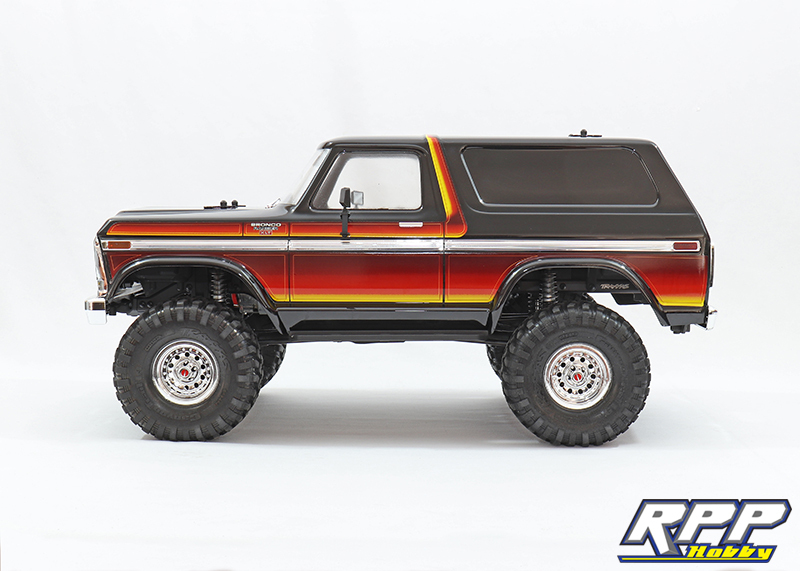 We decided it was time to take a closer look at the TRX-4 platform by grabbing one of the Ford Bronco RTR’s for ourselves. Let’s dig in and see what this thing is really made of! 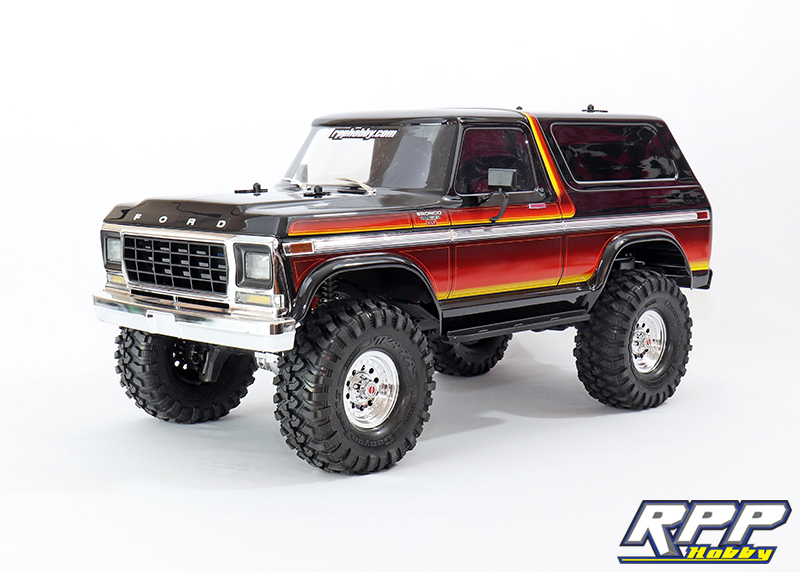 First thing we noticed is the beautifully detailed Bronco body, it almost has the appearance of being a hard body. Body off shots reveal the inner workings. Notice the integrated inner fenders, a nice touch that helps protect the electronics from debris. Here we can see the the ESC, which is 3S Lipo compatible, and the transmission shift servo. Flip the chassis 180 degrees and we can see the waterproof receiver box, 21t 550 aTitan motor, and the servos that lock the differentials front and rear. The retro looking chromed plastic glue-on wheels fit the part perfectly. 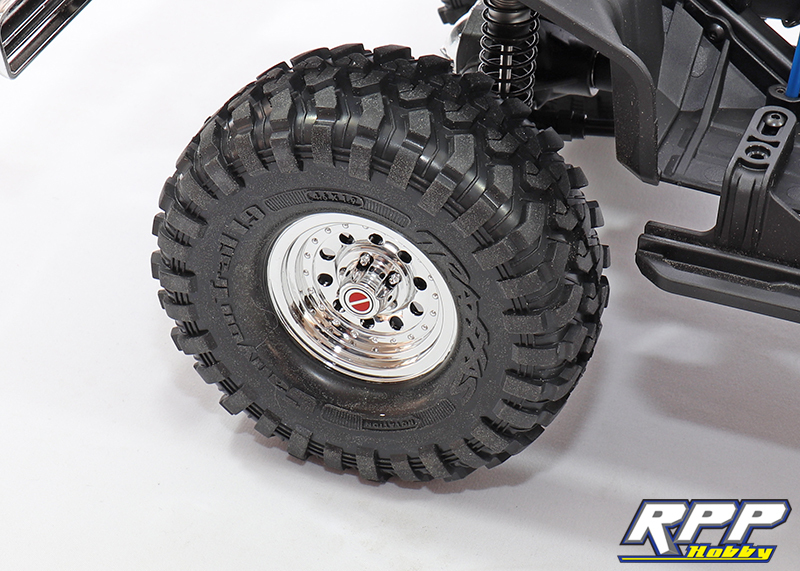 Traxxas also did a descent job with supplying a scale looking tire. The plastic center cap threads on over the wheel nut to give you a seamless set-up. Can you say ground clearance? 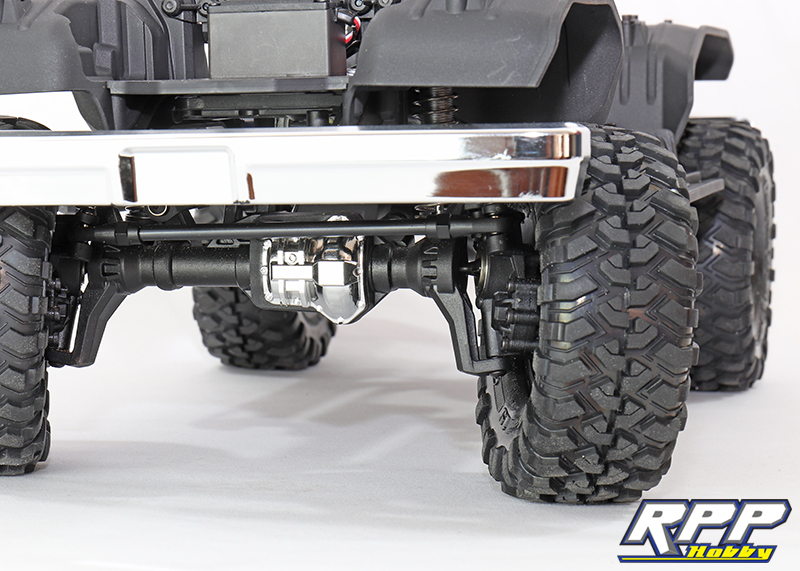 The portal axles provide tons of ground clearance over conventional straight axle set-ups. Notice the tiny gear box tucked into the backside of each wheel. This provides additional gear reduction at the wheels, which greatly helps reduce chassis roll and increase ground clearance. The steering servo is chassis mounted to add even more realism. 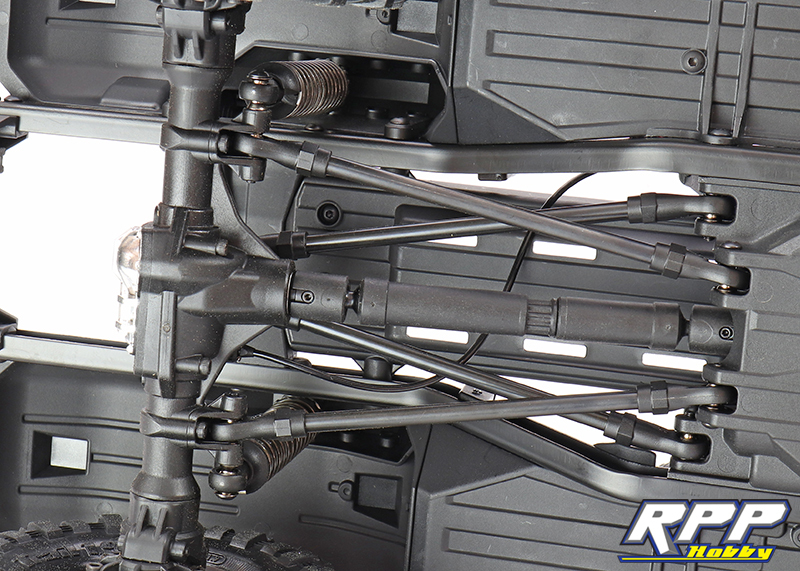 A look at the bottom of the chassis reveals all metal suspension links, with 3 link front and double triangulated 4 link rear. Here you can see the rear diff lock cable running to the rear axle. This is connected to the shift servo on the chassis to provide an open or locked differential on demand. In the real world most 4 wheel drive vehicles have “open differentials” from the factory. This means you have 4 wheel drive, but not all 4 tires are going to turn at the same speed all the time no matter what. An open diff set-up will be 4wd until one of more tires starts to loose traction. Once that happens all the power will be sent to the wheels that have lost traction, leaving them spinning while the other tires sit idle. A locked differential will spin all 4 tires at the same speed at all times no matter what. 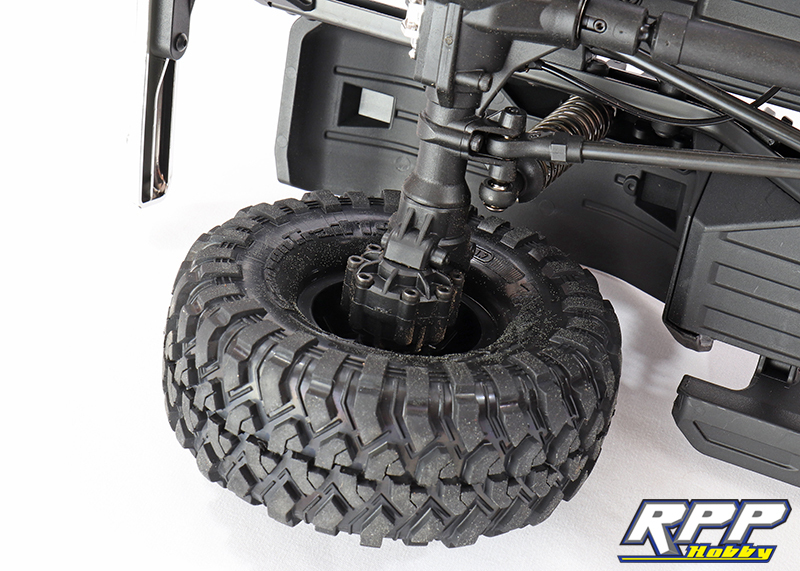 This is what makes an R/C crawler so capable. Having the option to pick between open and locked differential while on the fly with the TRX4 is actually a blast. It allows you to try obstacles in open diff mode first. If that doesn’t work, flip the three position switch once for the front axle to lock. If you are still struggling, flip the switch again and both diffs will be locked. A really fun option! A shot of the portal gearbox tucked into the rear wheel. Notice they are actually a separate piece that bolts to the axle housing. 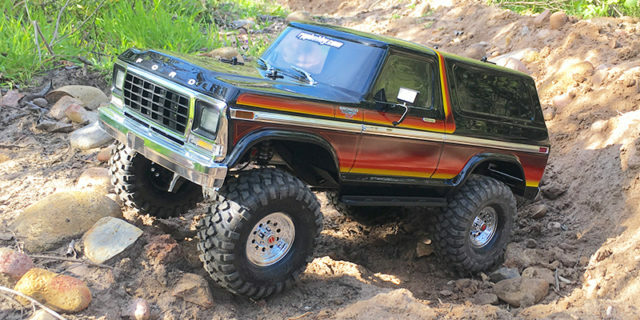 That brings us to the end of our Traxxas TRX-4 Bronco overview. 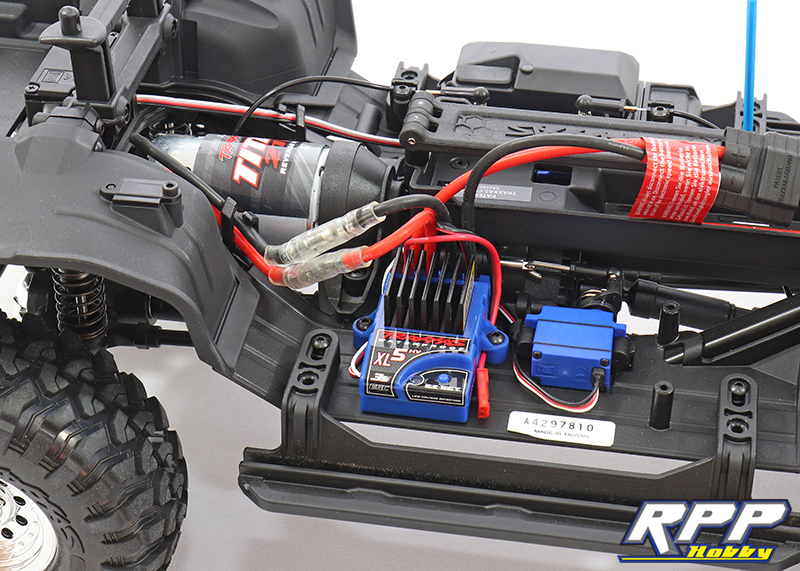 Overall we are really impressed with this first attempt at a scale R/C from Traxxas. They did their homework and brought us an incredibly realistic scale R/C platform that looks just as good as it performs! Be sure to check out the video from our first outing below. And as always, thanks for checking out the RPP Hobby Blog!